I frequently hear riders say, “I want my horse to trust me more,” yet the horse is pushy when being handled on the ground and will not navigate the difficult obstacles in a show or on a trail while in hand or under saddle. To get the horse to trust (and, at least attempt the obstacles) we must see things from the horse’s perspective. Horses operate on instinct and trust is naturally woven into it with a fragile thread. It must be earned. But trust from a horse is earned differently than between two humans. There are four rules to training horses that foster trust. It is based on entering their world and behaving as they would expect. 1) In horse culture there are no equals, you are a leader or a follower! In a herd horses have a pecking order that is neat, simple, and often brutal. They do not hesitate to bite and kick to establish the hierarchy. 2) They like to follow, but will only follow a clear and consistent leader. 3) They try to please those higher in the pecking order. 4) Instinct dictates responses to the first three rules. If the horse will not attempt an obstacle then we know there’s a breakdown in one of these rules. Instinctual recognition that a rule has collapsed triggers a breakdown in the leadership. The horse won’t trust the horse (or person) it regards as inferior. This is powerful and elegantly purposeful in the herd’s life, but it can also frustrate a handler. That’s because most humans do not appreciate how a horse perceives the world. They’re exquisitely sensitive creatures that can feel your heart beat while riding them. They can see and follow your slightest facial expression or body movements. If you watch them interact with each other it’s remarkable how subtly, yet effectively they communicate. If we are consistent in our cues and remember that the less we do (like move) the more authority we have in the horse’s eyes. When you train from the ground understand that your movements mean a lot. If you move, then you must take action and follow through. If you are not willing to follow through you force your horse to gamble – to decide to follow or not. That’s stressful. An even worse outcome of not following through is that you will lose all credibility with your horse. Indecisiveness means you’re not a leader in the horse’s eyes. Here’s the test I always use for trust. The alpha mare does not move without causing a reaction from others. Thus, if you’re moving without causing a reaction from your horse then you know immediately that your horse does not regard you as a leader. This is why they will not attempt an obstacle that their instinct says could be dangerous. On the other hand, if they regard you as the undisputed leader they will at least try. As long as they volunteer the attempt, then you’re making progress. It may be difficult at first but you must remain calm. Show no emotion and be very patient. Continue to give clear and consistent signals. Sweet talk and praise are not clear signals. Clear signals let the horse know that it’s wise to trust your leadership. Once leadership is established the horse will try harder to please. 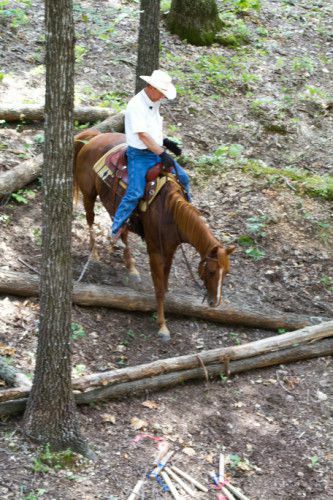 I like to teach the horse how to navigate obstacles from the ground first and then move to the saddle. Often it’s easier for the horse to read you and learn to trust you from the ground. When you’re in the saddle the horse must concentrate on the rider’s balance in addition to the obstacle. That may be a lot the first time out. It is also safer if the rider does not sit well or have a good seat. When riding you must keep the same focus and consistency that you had on the ground. 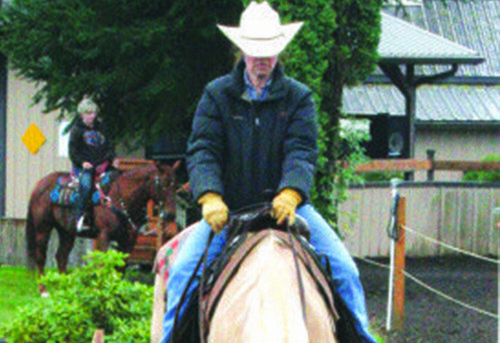 Understanding and following these steps will enable you to teach your horse effectively. It will lead to trust—and many happy trail rides. As with most technical challenges, proper training makes the impossible possible. My latest book, Extreme Mountain Trail Course by Mark Bolender is built on the Rush Spring Ranch in Missouri. It is visually beautiful and challenges the best of the best in Extreme Trail. After several weeks I held my first clinic on it. Before we formally began, the participants tried some of the obstacles and concluded they would be impossible to navigate safely. Fast forward to three days of training later – not only were they navigating well but the horses developed bold, confident and calm demeanors. The riders were also on a loose rein with broad smiles across their faces. Here’s how that was accomplished, and how you can also master the most extreme obstacles in a safe manner. I first started with a day of ground work where the Bolender Bubble was established and the horses learned to be driven. Unless the horse’s instinct finds you worthy of leadership then safety will be a major issue for you and the horse. If you are not worthy of leadership then the horse will react first and think second, instead of the other way around. That puts you and the horse in danger and challenging tasks will be difficult at best. Inside Rush Springs Ranch we started with simple obstacles. These consisted of poles and layers of poles and logs (which I call a Scrambled Puzzle), teeter totter and other obstacles which helped to establish confidence and boldness in both the horse and rider. I did not allow the participants to move onto the more difficult obstacles in the course until the simple ones were mastered. The most crucial skill the participants needed for the second day was developing leadership. The second skill was to learn to trust their horses’ instinct – and to trust me. I was asking them to navigate certain obstacles which they already concluded would be impossible. Thus, overcoming that belief (which is often self-fulfilling) by instilling confidence was enormously important to the participants. Day two started out hot and clear on the course but everyone was excited to begin. We started out driving the horses over and through several obstacles that were very similar to the day before. 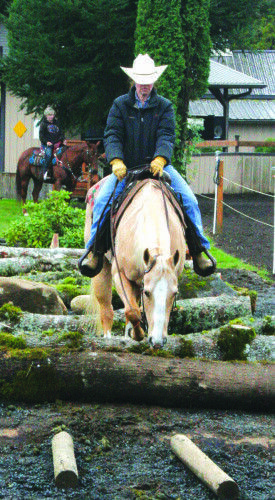 After several hours of work the horses and participants were becoming confident in navigating the obstacles in-hand. No one had mastered the balance beam but the rock steps and step downs were coming along well. By working in-hand the participants clearly saw that the obstacles could be navigated, and this gave them confidence in the horse. The horses were asked to “think it through” instead of being pushed from the first moment they saw the obstacles. This is a very different approach in obstacle training but the results can be astounding. Before long the horses were so bold and confident that they were pushing to go on their own. 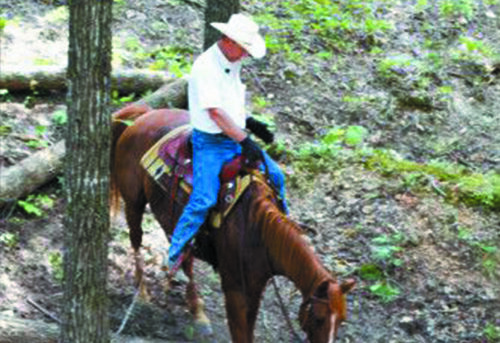 The next step was putting the riders on the horses and soon after that the horses were walking up and down the log and rock steps on a loose rein. Remember that the key to success—trust and confidence— starts on the ground. “Am I doing this right?” is a phrase I hear often from students. It’s very natural (and important) to learn proper riding technique, but many people get bogged down by details and they forget the reason they started riding in the first place: to have fun! 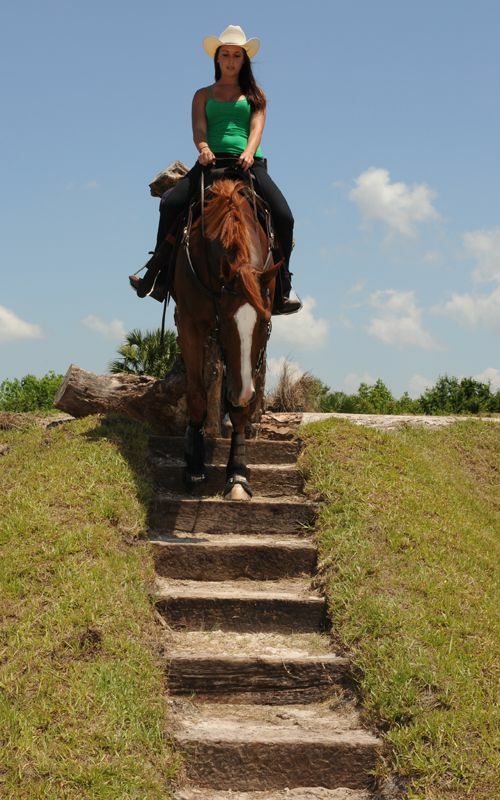 When you see a great trail horse on a practice course it looks so easy to do. Yet, if you try to replicate what you see, you’ll be amazed how difficult it really is. Whether you want to put in the training to become a master, or just play on weekends, Mountain Trail can be fun for any skill level. Start with groundwork. 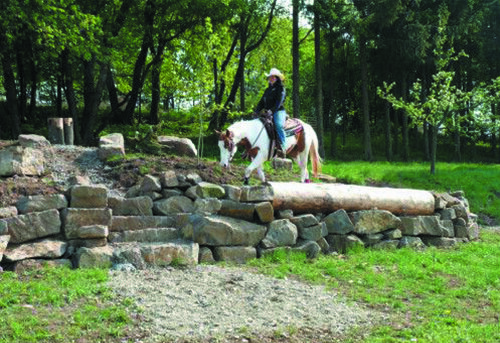 Allow the horse to build its confidence on the difficult obstacles such as rocks and logs. Learn how to drive the horse because that will build boldness and confidence much faster than leading a horse. The reason for this is that a horse is a natural born follower, and its instinct will be to blindly follow you. Yet when the horse is asked to address its own fears, you’ll find it quickly develops confidence and boldness. If you lead a horse, the horse will always need to be led when you come across a new obstacle. However, if you teach a horse to think it through, it will learn how to assess each new obstacle on its own. That’s when the magic happens. Driving your horse requires leadership. You need to get your horse thinking how to please its leader (you), which is a primary instinct. The horse will not try to think on its own if it does not see you as its leader. Just because you love your horse doesn’t mean that you’re the leader. To be the leader you must enter its world and lead by its rules. Once leadership is established, maintaining the role is easy. Make sure to adjust your leadership style— sometimes, ever so slightly— depending on the horse. A very sensitive Arabian needs different treatment than a pushy draft breed, for example. The general instincts are the same but, much like people, some need a leader with a soft voice while others require a soft voice and a big stick. Establishing your leadership in a quiet, definite manner, will make riding more fun for you and your horse. Thus, our job is to inspire the horse to attempt the difficult obstacles and believe in itself by being the leader who tells it, “You can do it”. This then develops into trust, and then the crucial partnership between horse and rider is established. When that happens, you’ll experience a new level in the joy of riding, taking you both to new, blissful places. Learning to listen is anything but easy. It is a science and a gift from God. With effort, we can all learn to be good listeners. If one learns to listen to his horse, the response given by the horse can be amazing. Both horse and rider must partake in listening. The horse must be willing to listen to instructions given by the rider. The rider must communicate in a manner that is clear and understandable to the horse in order for that horse to be willing to listen. You must enter the horse’s world of subtleties and body language in order to succeed in mutual communication. Four very simple rules run the horse world. The first rule is that the herd has a pecking order where there are no equals. It is harsh, clear, and orderly. Second, horses are natural-born followers when given a clear and consistent leader. Third, horses try to please those they perceive to be above them in the herd (this part is more of a mind game than a physical game). Fourth and finally, horses are controlled by instinct. Equine instinct is a different type of intelligence which is beyond our comprehension or ability. It also beats, frustrates and intimidates us to the point of letting our emotions rise to the surface and hinder training. When both you and your horse are not mutual listeners, instinct begins to run the show. The first step in establishing leadership while working obstacles from the ground is to ask your horse to complete a task without moving your feet. 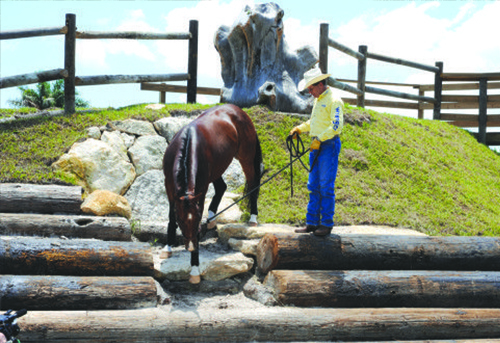 Whether you are asking for the horse to step over a log, onto a suspension bridge, into water, or over a balance beam, your cues will be the same. Ask for a forward response while moving your feet as little as possible. When the horse makes the slightest effort to do what it is being told, quit asking immediately. Treat them with dignity and respect by listening and reward them for listening in return. If a horse refuses to attempt an obstacle, then it is evident that the horse does not see you as being superior. The horse’s instinct tells him that the obstacle is too dangerous or scary. Therefore, if there is no leader, there is no reason to attempt to cross it. This demands that you become a clear and consistent leader or the horse will not see you as being above it in rank. Once leadership is established, ask the horse to try again but respect the horse by listening. Is it asking for more time to think? Timing, along with the ability to read the horse, is critical when either asking for more effort or allowing the horse time to process your requests. Some clues that the horse is processing your request include nosing the obstacle, pointing his ears forward, snorting, pawing and shaking. When we listen, have our timing down, and are clear and persistent in our request, the horse will see us as leaders and work to please us. From leadership evolves trust, which is then woven into instinct. Once leadership and trust have been established, it is amazing how small an amount of effort is needed for the horse to accomplish the tasks given. Always keep in mind that less is more when asking your horse to complete tasks. When you learn to listen, the horse will return the favor by giving you its all. Watching a great trail horse pick its way through difficult obstacles is wondrous and beautiful. It looks so natural and graceful that it seems anyone can do it. This, anyway, is the image a great rider and horse try to paint for the judges examining every movement in an Extreme Trail competition. In reality, achieving this look is exceedingly difficult and requires true unity of horse and rider. The sport of Extreme Trail highlights this unity of horse and rider brilliantly. 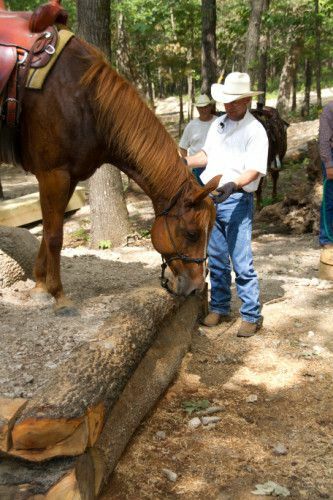 Training a horse properly takes time, patience and understanding. The result is a rider in-balance with his horse. The first step to getting horse and rider in balance is to understand the horse and to enter its world. When you watch horses interact in the herd it’s very clear that they have simple rules, all of which are driven by instinct. This instinct motivates them to select a leader who they follow and become eager to please. As trainers we can learn from this and use it to our advantage. Thus, my simple rules of training are based upon the horses’ world and their way of life. Horses have no equals in their world; all are part of a hierarchy. Horses are natural born followers, but only if one leader is clear and consistent. Instinct drives the first three rules. A horse’s instinct allows him to read the slightest change in a leader’s face and body language. As a trainer, what you do in the slightest way can cause your horse to reject or accept you as a leader. I’ve found that the less I do, the more I get because the communication is clearer. I like to start training the horse from the ground, not from the saddle. First I establish my “Bolender Bubble” by taking the place of the alpha mare. This is not a physical game but a mind game, and it’s the most important step. It’s done subtly but has profound effects. I will make sure that I can move the horse’s shoulders and haunches with little more than a thought. The “alpha” (leading) mare does not move her feet for other horses and walks a straight line from point A to B. For instance, if horses are between her and where she is going she does not walk around but right through the herd. The underlings will move out of the way. Thus, if you move without clear, pointed direction then the horse will perceive you as an underling, not the leader. In teaching obstacles, I will begin to drive the horse in front of me over poles and through cones to build confidence and boldness. This is different than leading the horse, as I am compelling the horse to move her feet through my own direction. When the horse is moving in a willing manner over poles and through cones, I then raise the bar and begin to drive him over more difficult obstacles such as logs, rocks, water and the teeter totter. The reason I do this in training is to teach the horse to concentrate on the obstacle and not on the rider. I always make sure to not put too much pressure on the horse. Patience is everything. 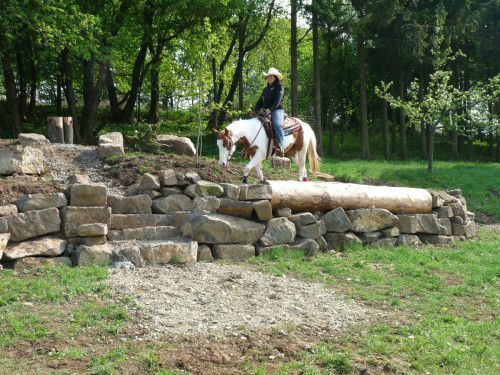 You can do great harm and take away the horse’s joy if you try to master the Extreme Trail obstacles too fast. Short sessions, about 30 minutes each, will give better results than long stressful ones. As the horse navigates an obstacle a little better than the day before, then you can stop; he will meet you at the stall door with a willing attitude. Once the horse is moving through the obstacles enthusiastically then it’s time to start training from the saddle.